Biographies have always been a favorite genre of mine. Learning about a person's childhood, their joys and sorrows, what motivated them and the crosses they bore through life always interested me. Buffett: The Making of an American Capitalist, Titan: The Life of John D. Rockefeller, Sr., and Iacocca are some of my favorites. I have G.K. Chesterton's St. Francis of Assisi and Saint Thomas Aquinas: The Dumb Ox along with Thomas Merton's Seven Storey Mountain on my reading list -- they've been there a while :) I will say, Chesteron being one of my favorite writers, I'm looking forward to reading both of those since Sts. Francis and Dominic demonstrate contrasting paths to holiness. Of course, the challenge to a biographer writing on someone like St. Francis is bringing something new to the table. 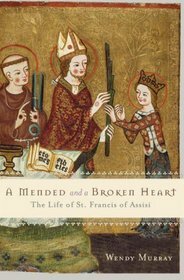 That's why I almost didn't bother buying this book, A Mended and Broken Heart: The Life and Love of Francis of Assisi by Wendy Morgan, especially since the inside-cover description makes the book sound slanted against orthodoxy. For instance, there's reference to St. Francis' "complex theology," the repression of certain details of his life by the Church, and his rushed canonization two years after his death (calling to mind the relatively quick canonizations of Blessed Teresa of Calcutta and Blessed John Paull II). Yet it also offered a quote I'd never heard before: "Don't be too quick to canonize me. I am perfectly capable of fathering a child." And from there, proceeds to mention the "crucial but completely neglected role that Clare of Assisi played in Francis' life and theology, both before and after his conversion." Maybe Francis had a little thing for Clare, eh? At any rate, I firmly believe we must die to become saints. Francis-the-sinner glorifies God all the more in becoming Francis-the-saint, and since I have a certain penchant for film noir and the dark side of humanity, I look forward to learning about Francis from a perspective that intentionally sheds more light on his weaknesses. Our sins show the way to holiness in that they reveal (in a disordered way) truth about ourselves that we can easily miss simply because we only see the sin and never look deeper into what it is we are fundamentally attracted to and how the seed of goodness within can be nurtured from depravity and death into goodness and life. I won't be able to start this one right away. I'm finishing The Princess and the Goblin and just started Brew Like a Monk while in the middle of Screwtape Letters, The Call of the Wild and White Fang, and In Business As in Life, You Don't Get What You Deserve, You Get What You Negotiate. Needless to say, my interests are varied... and I should get some Amazon credit for all these links!